Have you noticed a lot of pineapples on the internet lately? This might be a trend for now, but I'm perfectly fine with having pineapples and other fruit around all the time. Which is why I decided to invest a little time into a bigger fruity quilted placemat project. This pineapple is the first of four fruit designs. Each has an English paper pieced fruit (with a face, of course!) which goes onto a quilted placemat base. The rest of the fruit will come along here on Wednesdays for the rest of July. Are you ready to fill your table with happy fruit? 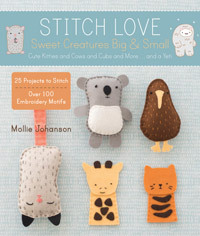 Let's get stitching! Cut the quilting cotton to 15 x 21 inches and cut the batting and linen to 13 x 19 inches. 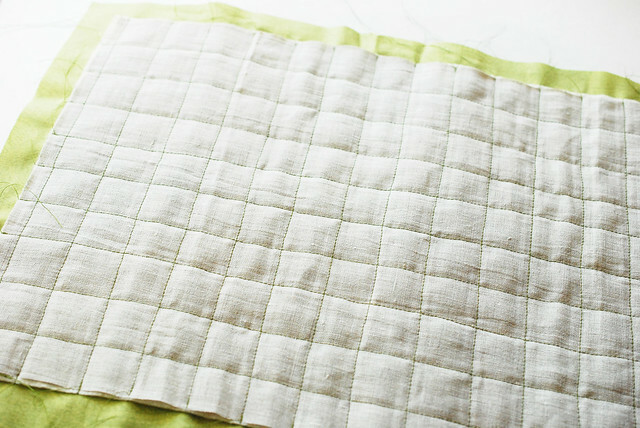 Lay the quilting cotton wrong side up, then place the batting and linen on top. Pin the layers together. 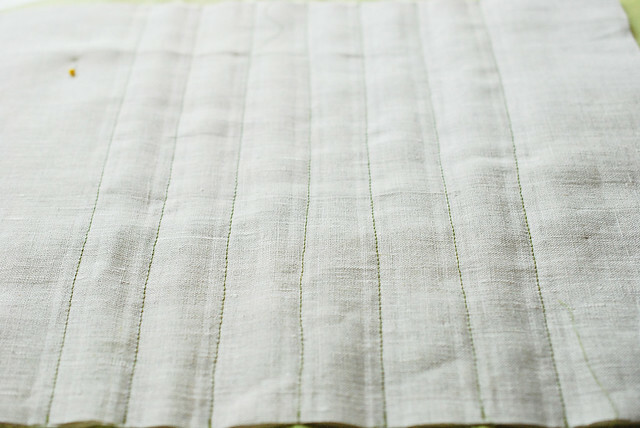 Mark a line straight across the middle of the linen, making sure that it isn't angled from the edge at all. 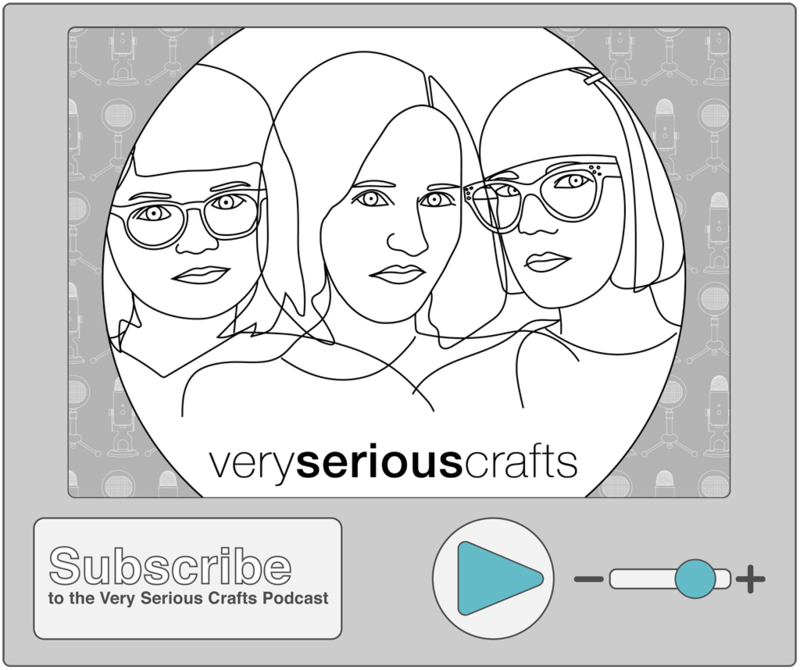 This will be your guide for quilting. It's a good idea to start at the center and work out to the edges. 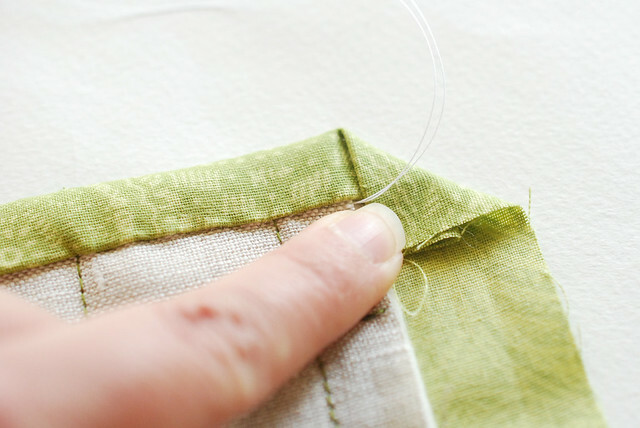 Sew along the line, following it, but not keeping the stitching perfect. Back stitch at the beginning and end of the line, but only a small amount. 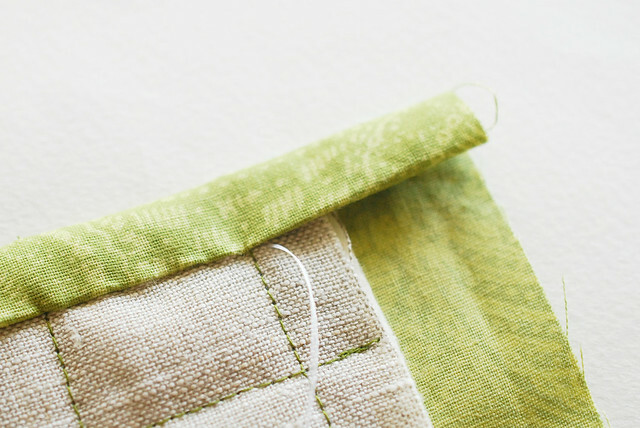 Be sure to keep the stitching only on the linen, and don't go onto the backing fabric that is extended past this. 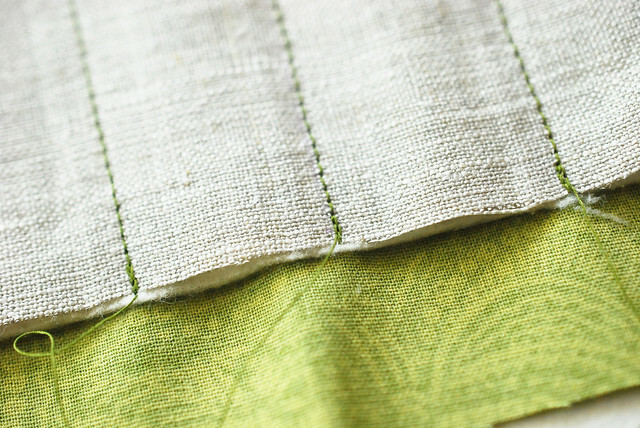 I used a green thread that is darker than the backing fabric, so it still shows on the back some, but it especially contrasts with the linen. Continue adding lines that aren't quite straight, but never getting too far off. Space them about 1 inch apart. If you just eyeball it, you're more likely to get the casual lines we're going for here. Every couple of lines, check that you haven't gotten too far off. Again, you don't want these super straight, but you don't want them really crooked either. 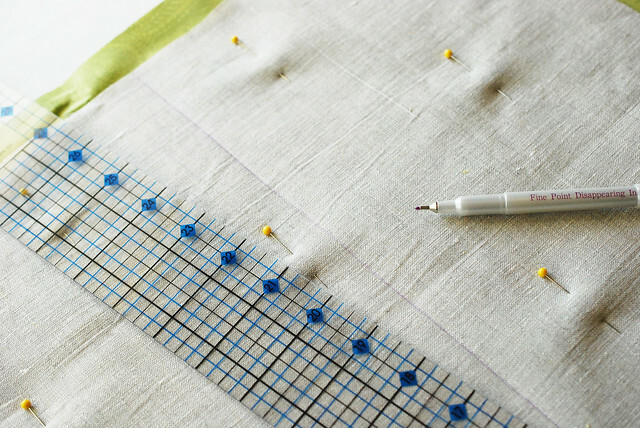 Now, turn the placemat and mark another straight line in the center, perpendicular to the stitching you've done. 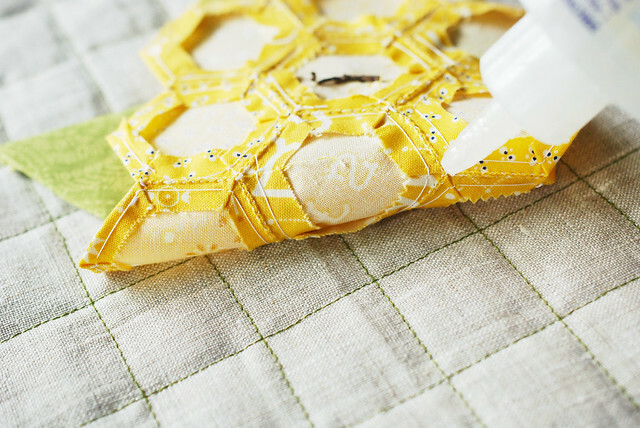 Follow the same process to finish off the gridded quilting. 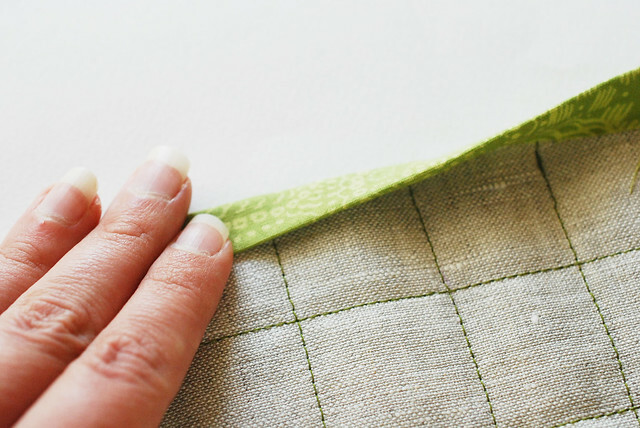 To bind the edges of the placemat, fold the edge of the backing fabric in to the edge of the linen, then fold it over again. Doing this with an iron will help it hold, but you can finger press it and it will be fine. 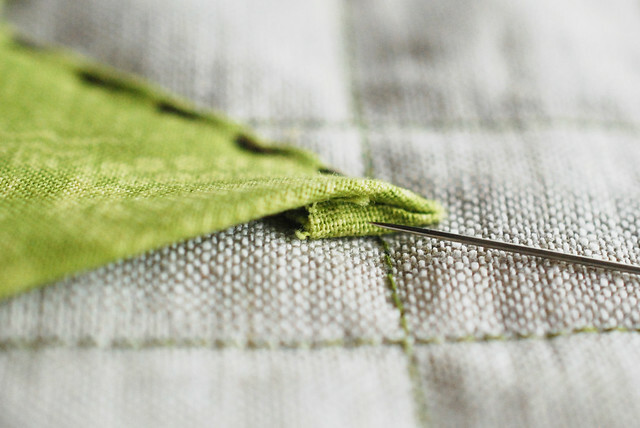 Thread a needle with some regular or hand quilting thread, then starting in the middle of one side, stitch down the folded fabric binding. I'm using ladder stitch because it's pretty much hidden, but running stitch would also be very cute. 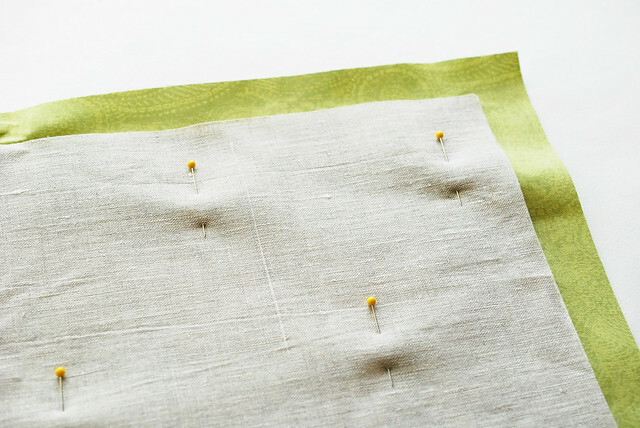 For running stitch, I'd recommend perle cotton instead of regular thread. 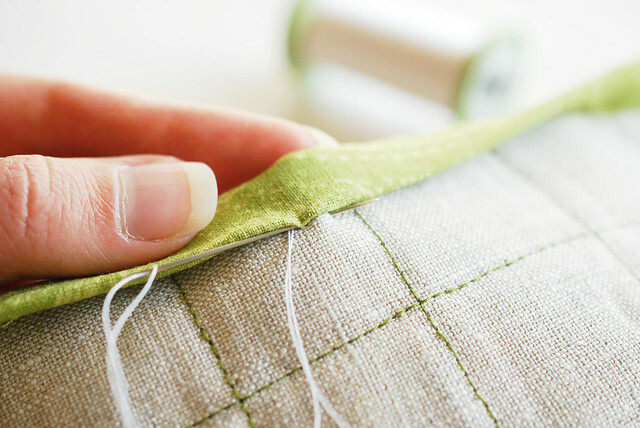 When you reach the corner, stop stitching about 1/4 inch from the end. Then, fold down the corner as shown. 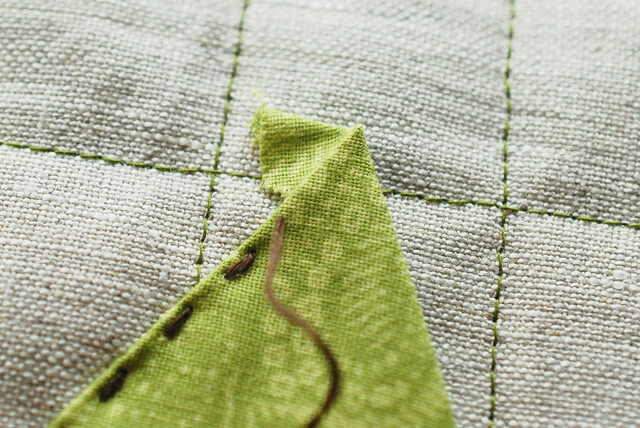 Fold down the next edge, and then fold it a second time and start stitching it down again. Make your way all around the placemat. 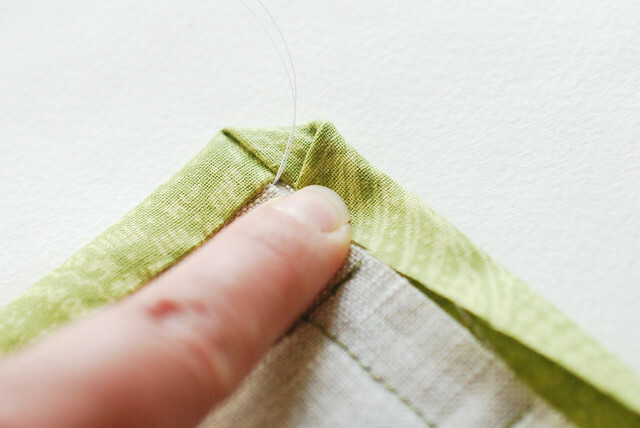 When you run out of thread, simply anchor the thread with a knot that is through the batting and linen and hidden under the binding. Start the next thread, anchoring it in the same way. If you plan on making the set of four fruity quilted placemats, you can go ahead and make four mats just like this. 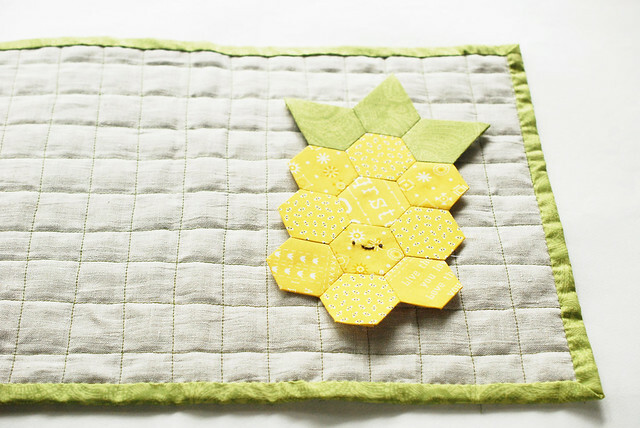 Now, let's make an English paper pieced pineapple! Use your favorite EPP basting method (here's what I do!) 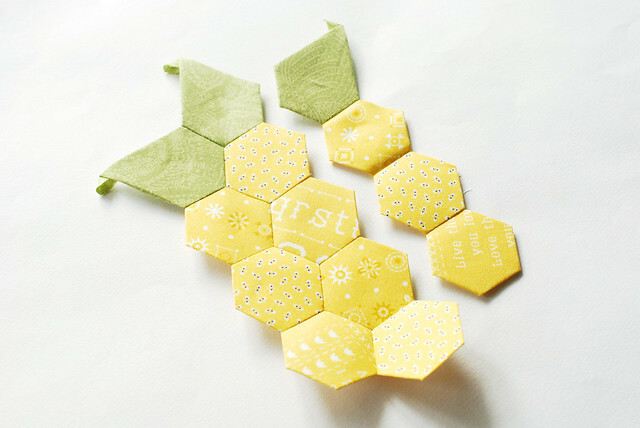 to make ten yellow hexagons and three green jewels. 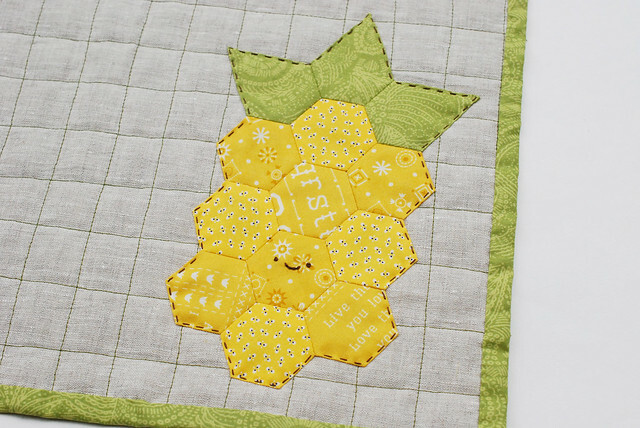 I used a mix of a few fabrics for the yellow, and the same green as my backing for the leaves. Arrange them in the order you want them in. Join the pieces together in rows, then join the rows together. 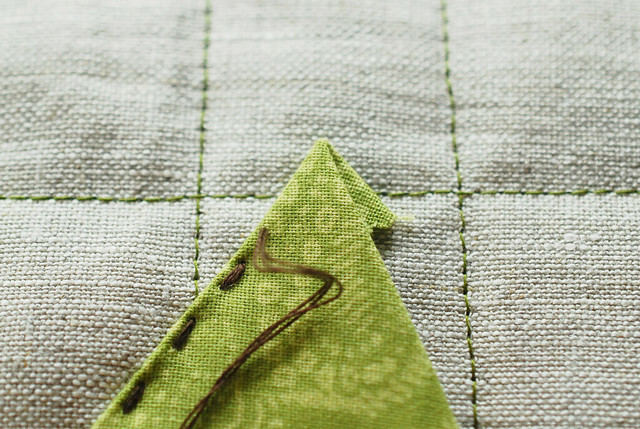 I've been using tiny running stitch for my joining lately, and I love it. 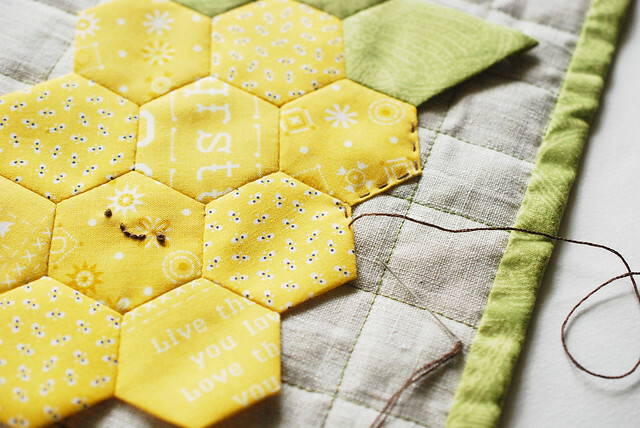 Remove the template from the center hexagon, one up from the bottom. 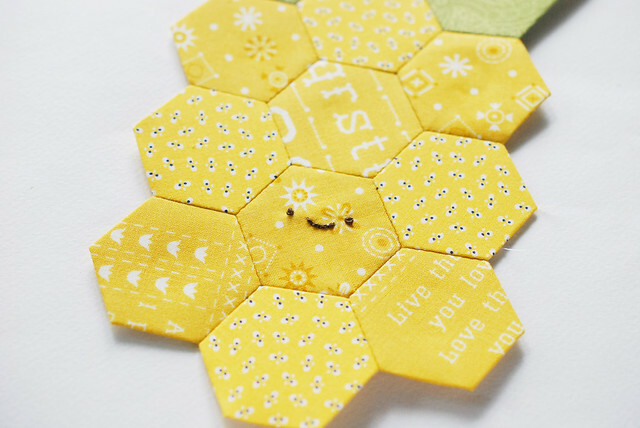 Embroider the face onto this hexagon. I used french knot eyes and back stitch for the mouth, using all six strands. 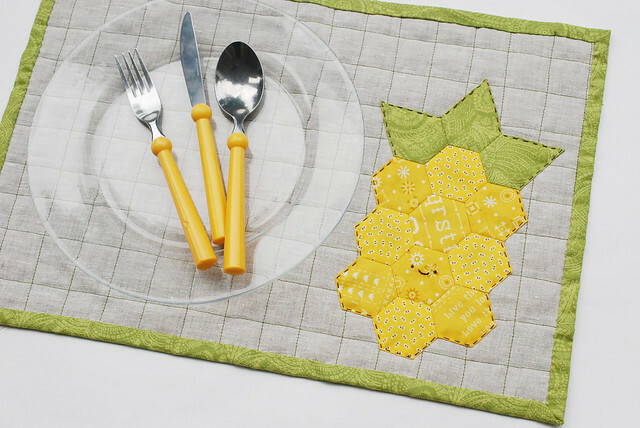 Remove the papers and lay the pineapple onto the finished placemat where you want it. Mine is at a slightly jaunty angle. Use fabric glue to attach the center of the pineapple to the mat. You'll only need a small amount and you can run it along the lines that join the hexagons together. After the glue has had a chance to set for a little while, thread a needle with three strands of embroidery floss and knot the end. 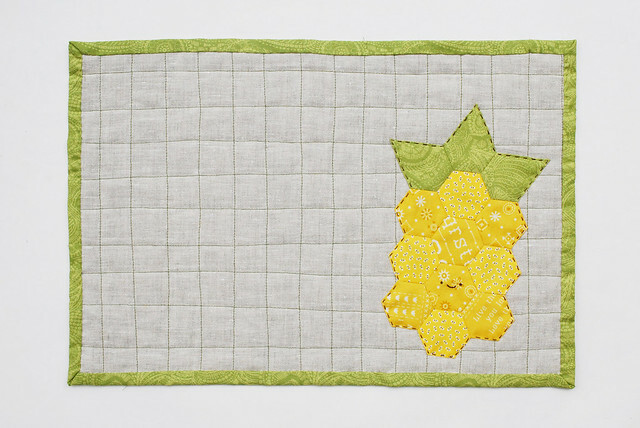 Use running stitch to attach the edges of the pineapple to the placemat. These will show on the back too, so try to keep them as neat as possible. When you reach one of the leaves, trim the flap a little and fold it to the other side. Pressing it with an iron helps if it's being stubborn. Stitch up to the point. 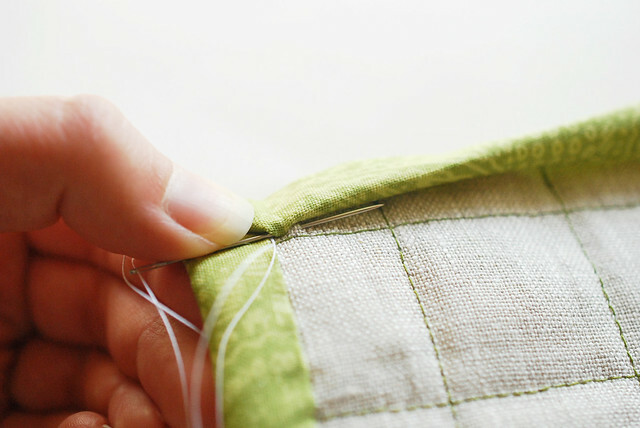 Use your needle to fold and poke the excess flap under the point, then stitch down the side. Repeat this for each leaf point. 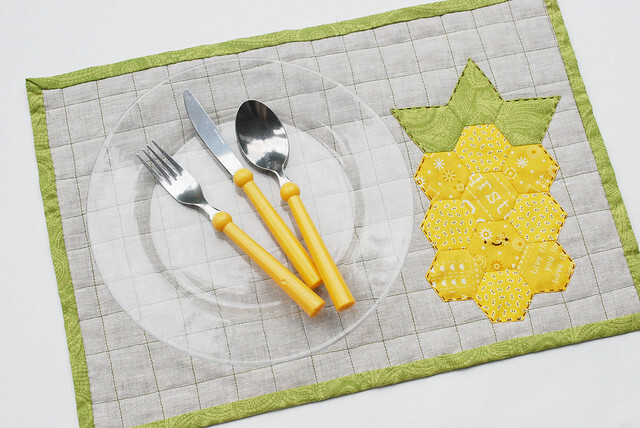 Once the stitching is done, your placemat is ready! 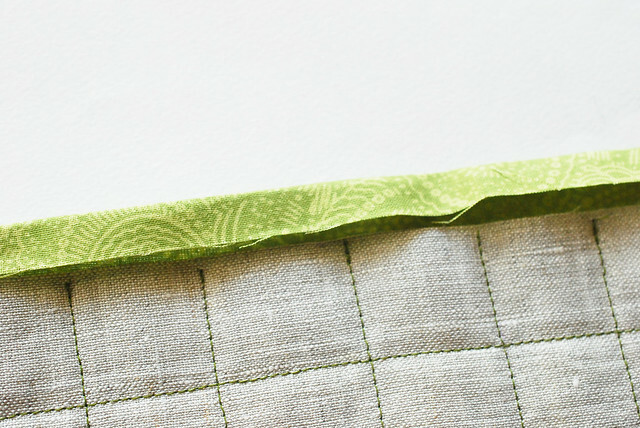 The organic quilting lines are one of my favorite things about this mat, and let me tell you, they are so relaxing to sew! But of course, the fruit with a face wins out for my fave. This happy pineapple is so glad that he gets to sit at your table with you! Come back next week for another fruit...what will it be? Such an adorable and very clever idea. Thanks for the great tutorial. This is crazy cute!! 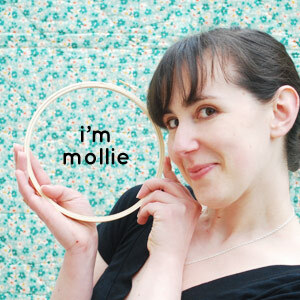 You are soooooo clever and creative, Mollie- thank you so much!! I saw this guy on your instagram and I couldn't wait to see what you were going to do with him! I LOVE HIM!! I can't wait to make this and see what other fruits are going to make an appearance! Thanks so much!! How cute is this!?!? 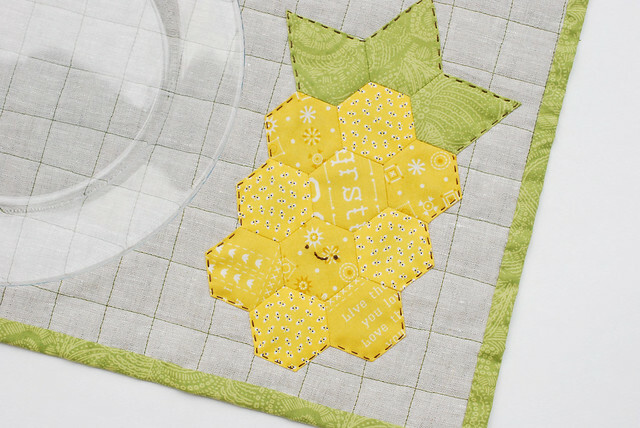 I've been seeing hexies everywhere lately and have yet to try them! 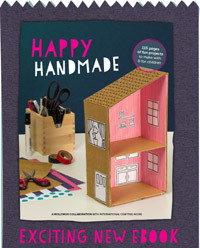 I think this little project would be PERFECT to try making them for the first time! 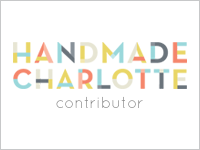 I look forward to seeing what other fruits you are making. I'd love to see strawberries and oranges!! Thank you!